Related below are the experiences of volunteers, staff and campers. The names of participants, individuals with intellectual and other developmental disabilities, may have been shortened to protect their privacy. I look forward to Camp Happiness. I always have a good time. My favorite things to do there are the dance, getting exercise and making bracelets. There is nothing about camp I don’t like. I can’t wait to go again next year. Thank you! I did enjoy basketball and playing football. When I kicked the ball and ran the bases during the kickball game it made me feel happy to be a part of the team. Also dancing was fun! Camp was good this year. It was nice to see people that I have not seen in a long time. This year’s baseball and soccer games were fun! We had nice weather. Hope to see you all next year. My favorite part of camp was art& crafts. I love to color! The Elks Volunteers are very friendly. I really liked our camp leader, he was nice guy and good to our group. We hope to have him next year! I loved going on the hike in the woods and learning about it. I enjoyed being on the paddle boats in the water. I also enjoyed arts and crafts, painting rocks, the bonfire and making s’mores. I enjoyed bell ringing and rock climbing. I also liked the carriage ride. I am looking forward to go back next year! I really liked the paddle boat. I also had fun on the horse carriage. I hope to go back next year! My most favorite activity was swimming. It felt so free moving my arms and legs in the water. I can’t do that in my wheelchair. I participated in making tie dyed socks, rock painting and planting flowers. 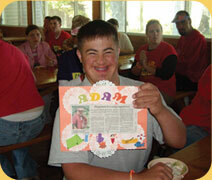 I’m full of smiles thinking about returning to Camp Happiness next year! We had fun! I liked going to Camp Happiness. I liked all the activities I participated in. I made a hat, tie dyed socks and I planted flowers. My favorited activity was kickball. I can’t wait until next year to attend Camp Happiness. My favorite activity that I participated in was ringing the bells. I also liked when we roasted marshmallows at the campfire. Also I had fun playing toss with the bean bag. I am looking forward to returning to Camp Happiness next year! I loved everything about camp! The staff was very nice and kind. I just had a lot of fun. The camp fire, art and crafts were great! My favorite activity was making the hats. I liked playing basketball, ring toss and bag toss. Swimming was the best. I hope to go back next year. Staff at Camp Happiness were amazing. My camp advisor was Will. I thought he should get an A+ for everything he did. I enjoyed all three days and swimming. I especially liked bean bag toss because Janice played with me and I really had a lot of fun. Thank you so much, your Camp Happiness friend. Camp was all in all fantastic, very pleasant staff. I loved seeing all the positive attitudes. My favorite part of the week was doing archery. I have never seen the people I support so excited to try something new; though I did enjoy all the activities. Hope to see you next year! Thank you for including N.C.P. Watching Ron D. climb up the rock wall and get half way up was a truly unforgettable moment. He didn’t give up and was very determined to keep going. Camp Happiness was the greatest experience we could have hoped for. The camp itself was very nice and the view of the lake was gorgeous. The counselors were great, especially our counselor- Jon. Jon made each individual feel special while he encouraged and cheered for their accomplishments. Watching the smiles, hearing the laughter and seeing the proud look on the faces of the individuals as they successfully did and activity that they may never have gotten to do if not for “Camp Happiness” was amazing. Our Individuals loved the whole camp and all the activities. The camp counselors were great! The food was good, and activities were really well planned. The staff were amazing and they did a great job interacting with the individuals. Tye-dying the socks was a wonderful ideal! I will be using that idea at a party.